The real joy of online betting nowadays comes not from the most obvious markets, but rather from the ones that you can simply invent yourself. More and more bookmakers are allowing customers to Request A Bet, which is quite literally what it sounds like. Instead of needing to bet on one of the main options available in the shop or online, you can instead combined a number of different factors in order to come up with your own market and see if they’ll give you odds for it. I’ll go into more detail about this feature on these pages, but essentially you’re inventing your own market and the more things you add to the bet the longer the odds will be. Think of it as like a mini-accumulator, if you like. All of the bookies tend to give this feature their own name and they’ll also have their own events that you’re allowed to ask for, but in essence it works the same way no matter who you’re betting with: you come up with some events, tweet them using a hashtag and they’ll let you know the odds they’re willing to offer. Read on to get a clearer idea of what it’s all about. In years gone by, it was possible to simply walk up to the counter in a bookmaker’s shop and ask them to give you odds on something happening. One of the examples of this that always sticks in my memory occurred in 1994 when a man named Eddie Kirkland went into his local bookie’s and asked for odds on his son playing for England at football before he turned thirty. Twelve years later and Chris Kirkland was selected in goal by Steve McClaren for a match against Greece, seeing William Hill pay out on the £98.10 that has odds of 100/1. Less headline-grabbing bets were won a regular basis in the past, of course, with people regularly requesting odds on far more obscure things taking place. Request A Bet is an attempt to re-discover that art of punters thinking that they can find an edge that the bookmakers haven’t though of, allowing them to ask a bookie directly for odds on something specific occurring during a match. Let’s say, for example, that you think Romelu Lukaku is going to be First Goalscorer, Manchester United are going to win and both teams in the match are going to score. You can contact your bookmaker of choice and, if they have a Request A Bet style feature, they’ll get back to you giving you the odds on it happening. You can then choose whether or not to place the bet, depending on if you think the bookie has been generous enough with their odds. Again, that list is not exhaustive but it gives you a good idea of the sort of markets you’ll be able to consider when you’re thinking about what sort of bet you want to place. If you’re in doubt about it then just get in touch with your favourite bookie that offers the service and request your bet; they’ll soon let you know if they won’t give odds on what you want! The obvious question that springs to mind once you know what Request A Bet is as a feature is ‘what’s the point of it?’ After all, bookmakers nowadays offer countless markets, as I said before, so why bother coming up with your own? Why not just use the accumulator function to add your various options together and see what odds you can get? The obvious answer is that not all bookies will cover the markets that you want to bet on in standard fashion. If you can’t find a market in the main list of those covered then you’re obviously going to struggle to add it to an Acca! There’s also the fact that you might well feel that you have a bet worth placing that bookmakers don’t naturally offer. Let’s say you’ve been following a player on Twitter and have discovered that they’ve been kicked out of their house by their partner. You’ll know that they’re not going to be in a great frame of mind for the upcoming match, perhaps demonstrating on social media that they’ve got a bit of a short temper. You also know that they’re the team’s defensive midfielder and have made more tackles than anyone else in the side, meaning that the opposition’s chance of getting on the scoresheet has increased if they’re not in the right frame of mind. Requesting a bet on them to be sent off and their team to concede three or more goals will likely see you get really good odds. It can also help you get a bet in spite of related contingencies. ‘Related contingency’ is a term that refers to two markets which have related outcomes. 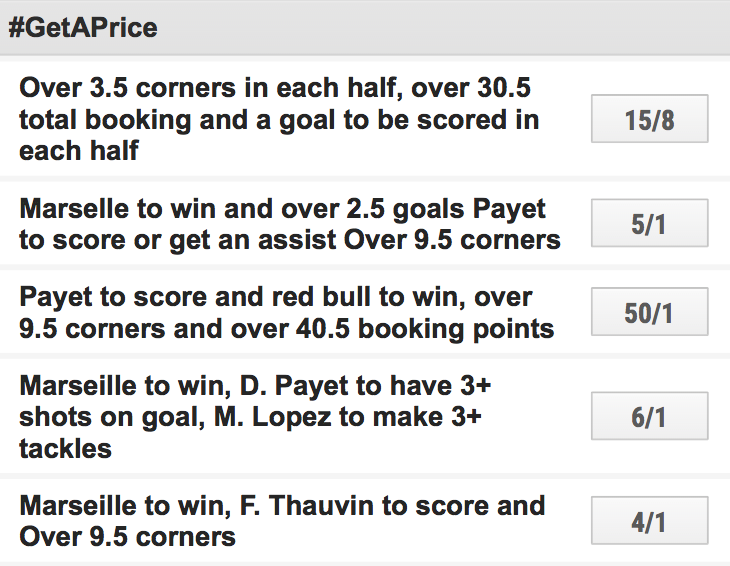 Say you’re betting on an Anytime Goalscorer and Correct Score in the same game, one will affect the other. That means that they can’t be combined in a normal multiplier. Bookies cover this by offering the likes of Scorecast and Wincast, but obvious there’s a limit to the range on offer there. The Request A Bet system allows you to bet on a whole host of related contingencies that you might not otherwise be able to bet on. That gives you so much more choice and so many more possibilities. After you’ve questioned what the point of it is, the next question is naturally going to be about whether or not there’s any value in your bet, should you go ahead and request it. The short answer is almost certainly going to be ‘no’, to be perfectly honest. That said, it only lacks value if you compare it to a bet that you could ‘create’ yourself by making a double, treble or accumulator and then betting on that. If the markets aren’t available for Accas, as I’ve just said, then even a bet that seems to lack value will still be worth placing via Request A Bet as you simply wouldn’t be able to place it otherwise. Ultimately, a bookie’s responsibility is to make a profit or, at the very least, limit their losses. This is easy enough with markets that are essentially binary, such as Home Win / Draw / Away Win, but once you start adding in variables like First Goalscorer or First Player to be Booked it becomes more complex. As a result, bookmakers will give themselves higher margins in order to cover possible losses from a market that they can’t be all that certain about. Naturally, higher margins for bookies means smaller profits for punters. There’s not a lot you can do about that, of course, but it’s worth bearing in mind should you Request A Bet that you think should have really long odds but they end up looking mediocre at best. Another thing that results in a lack of value in bets that you’ve requested is the fact that bookmakers don’t have too offer really good odds in order to keep up with their competitors. There are so many different bookies out there, meaning that they all need to work hard to win your business. With the biggest markets they’ll all shift the odds that they’re offering in order to ensure that you don’t turn elsewhere to place your bet. What that means, obviously, is that when you Request A Bet separately you’ll find that they don’t need to do anything to be competitive as its a tailored bet for for an individual. The only way to mitigate this is the request the same bet from several different bookmakers and see what odds they each offer you. 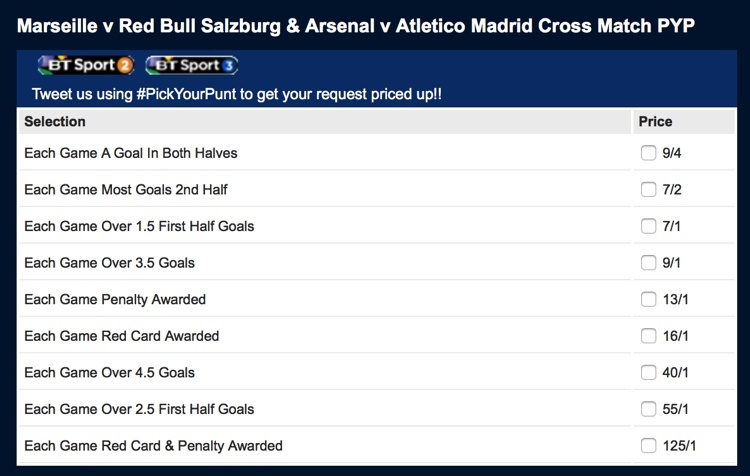 There are a few different bookmakers that offer the Request A Bet feature. That means that, even if there isn’t much that you can do about the odds that you’re offered, you can at least try a few different companies and see if one of them seems to be better for the sort of thing you’re after when compared to another one. I’ve had a look at the main players for you in order to see what they all do, how you can request bets from them and how the service works. Coral’s Request A Bet service is called #YourCall, giving you a chance to come up with your own bets and see what odds they’ll give you. The simplest way of doing it is by sending the company a Tweet using the hashtag #YourCall. Alternatively, you can have a look through the requests that other customers have already made, seeing both the markets that they’ve asked for and the odds that they’ve been offered. You can also have a look at markets involving specific players if you want. If that’s something that tickles your fancy then you can bet on things like stats, such as how many tackles a player will make, how many assists they’ll get or how many tackles they’ll make. Likewise you can bet on the likes of player being shown a card, scoring an anytime goal, or having a given number of shots. Combining one or more of those with an obvious market like Match Result could see you get some decent value. Though all of the bookmakers that offer the service are essentially offering people the same thing in order to keep up with the competition, they’ve obviously all got to give it its own name in order to be unique. For Ladbrokes that name is #GetAPrice, maintaining a hashtag like Coral have in order to point to the social media aspect of the entire enterprise. Ladbrokes’s approach is actually similar to Coral’s in more ways than one, with player / stat combos being their main way of approaching everything. It’s not massively surprising that Ladbrokes and Coral’s way of offering the Request A Bet feature might be similar, what with the two companies having joined forces in November of 2016. That’s why Ladbrokes also offer the service on the Premier League, the Championship, Spain’s La Liga and Italy’s Serie A. That said, you’ll be able to get it on major European competitions like the Champions League and Europa League if you want, plus the Scottish Championship. I wouldn’t be surprised to see the feature available for the likes of the World Cup and European Championships when they roll around, too. Just as the list of competitions covered largely depends on whether or not there’s a big game taking place in it that’s caught a lot of attention, so too will the markets be varied if there’s a reason for Ladbrokes to offer them. Generally speaking, though, the list from Ladbrokes is the same as the one from Coral, so I won’t repeat it all here. It includes the likes of players to score, get booked or rack up a certain number of assists, with the ability to look at #GetAPrice requests that other customers have made and take advantage of them also on offer. Now that you’ve read a couple of these you won’t be shocked to learn that Betfred have got their own version of the feature and that it involves a hashtag. They’ve opted for the rather more risky title of #PickYourPunt, which could cause trouble in the pub if you mispronounce it. Unlike the others on this list, they don’t give a list of competitions that they’ll offer the ability to choose your own bet on, instead covering what they refer to as ‘Qualifying Events’ on a weekly basis. In fairness to the Manchester-formed bookie, they’re not ungenerous with the events that they’ll offer odds on. At the time of writing I can see matches from the Premier League, La Liga, the Bundesliga and the European League, as well as some non-football related sports such as the Formula One and snooker. They’ve opted not to be too prescriptive on the markets that they’ll cover, too. Perhaps that’s an attempt to attract customers that have looked at other bookies and feel that they’re not offering enough markets to keep them interested. Regardless, by the time you’ve actually gone through Tweeting them a few requests you’ll find it’s pretty much the same things that they’ll offer it for. One thing that does separate Betfred out from the pack is their willingness to look at cross-match betting when appropriate. That’s something that not every bookmaker will do, instead asking punters to create Accas if they want to bet on something happening in two matches in the same competition. 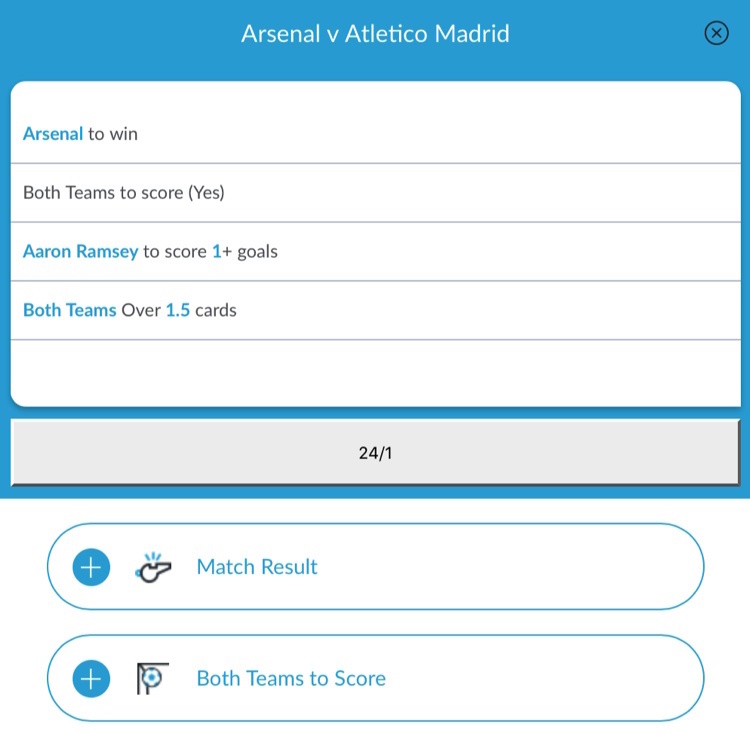 You can see above that you can bet on popular markets to occur in both the Marseille versus Red Bull Salzburg game and the match featuring Arsenal against Atletico Madrid, such as a Penalty In Each Game and Each Game having Over 2.5 First-Half Goals. As with the others, if you can’t think of your own bet then you can just have a browse through punts that someone else has already picked. Last but not least comes BetVictor, the bookmaker that has, at last, abandoned their dreadful advertising campaign with Paul Kaye as Maurice. That’s not relevant, I just wanted to express my relief at the situation. What they have done is gone for a title of #PriceItUp in terms of their version of Request A Bet. As with the others, it’s aimed mostly at the social media crowd and Twitter users in particular, hence the use of the hashtag. 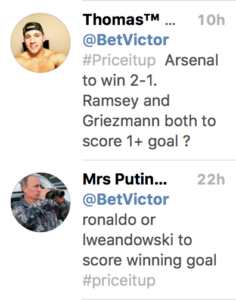 The best way to get yourself a bet priced up is by sending them a message on Twitter, too. A quick look through the hashtag will give you an idea of the sort of markets that you can get offers for, with BetVictor quick to send things off to their trading team in order to give you an answer when they can. You can add numerous different things to your bet and the more you add in the more likely it is that you’ll find yourself on the receiving end of some long odds. As with all of the other bookies on the list, BetVictor place previously sanctioned #PriceItUp requests on their website, so it’s worth having a look at what other people have been asking to see if any of them trigger a bit of inspiration for you. Those of you that adore special offers will be pleased to know that BetVictor often have some on the go, especially if you’re a Liverpool supporter. They’re the Principal Partner of the Premier League side and as a result will often have deals on the go specifically for those that want to bet on the Reds. That doesn’t mean that you have to support them, obviously, just want to place a wager on them. Before Liverpool’s Champions League tie against Roma in the 2017-2018 season, for example, you could get a free £5 #PriceItUp bet if you placed one with them on the match. I’ve mentioned Twitter several times in those reviews for one simple reason: that’s the platform that most of the companies want you to use if you’re hoping to Request A Bet from them. They idea, of course, is that enough people do it to catch the attention of others and they can win themselves some new customers. It’s essentially like free advertising, so who can blame them. All you need to do is Tweet them at the company’s official handle, such as @Coral, adding in your bet idea and the hashtag. They’ll then get back to you with a price and you can take it if you want to. Some companies will let you make the request from within their mobile app, though that’s not the case with all of them. If you’re unsure then simply open yourself a Twitter account, tweet your bet to your company of choice and see what they say. At the very least it will give you an idea of how it works and you’ll be able to get a handle on the whole exercise. All of the bookmakers here are aware that not everyone uses social media, however, which is why they put up all of the requests that they’ve answered on their website. They usually separate them out into the different matches that are taking place, although you can almost always find a direct link if you look in the right place. Obviously, the more of them you add on to your list, the higher the odds on the bet will go. As I say, this is essentially the same as Request A Bet but it’s only on given markets. It’s a really good way of getting an idea of the sort of prices you might get if you don’t want to add the same things to an accumulator for some reason. I’ve written an in-depth article elsewhere about Maximum Payout Limits, so do check that out if you want to know more about the topic. As far as this is concerned, the important information to learn is that some bookmakers will often add their own specific limits to the Request A Bet feature. That means that the amazing odds you’ve been offered might not be as good as you think if you like to bet big. As an example, BetVictor adds a Maximum Pay Out Limit of £5,000 to their #PriceItUp offers, so a £500 wager on a bet with odds of 10/1 will hit the limit immediately should it come in. That limit is per customer, per bet though, so you can place multiple bets on the same day. Other bookies will differ with their own limits, so if you tend to bet an average amount like £10 or £20 then you’ll almost certainly be ok. If you like to bet more then have a look through the list of top bookmakers I’ve mentioned above and see what their limits are, in case there’s one that meets your requirements more accurately. The most obvious thing, of course, is to ensure that you at least check for limits so you know what you’re dealing with. I’ve touched on this already, but being sensible with the bets you place will help you ensure you don’t end up losing out on money. The best thing you can do is check out the existing markets if you’re coming up with a Request A Bet that you think looks like a market bookies might normally offer anyway. I’ve seen instances before where one bookmaker was offering odds on a requested bet of 10/1, whilst another bookie was offering the same thing for 35/1 just on its normal sportsbook. The best way to avoid that sort of thing from happening is by only using the Request A Bet market when you’ve exhausted the possibility of finding the same thing elsewhere. The other way of being sensible is by avoiding falling into the trap of adding selections that are unlikely to happen just because it will lengthen the odds of your bet. I’ve written about Correct Score bets elsewhere and in that piece I’ve talked about the fact that only eighteen games out of three-hundred and eighty finished with more than 4.5 goals. Adding that option to your bet might length the available odds, but that’s mostly because it’s got a less than 5% chance of happening. We all love long odds, but the Request A Bet feature can tempt you into adding daft outcomes in order to achieve them. I mentioned the offers that BetVictor put forward to those watching Liverpool games earlier, but that’s not the only type of offer that you can get. Bookmakers are fond of offering promotions when they know that the bet type has small margins and customers might not be all that keen in taking them up on it. Request A Bet features probably do fall into that category, being honest, and that fact, combined with them still being a relatively new phenomenon, means that you will almost certainly find offers if you shop around. ‘Bet £10, Get A £5 Free Bet’ is an example of that sort of thing. It’s a way of letting you try the feature in what is essentially a risk-free manner, in the hope that you’ll try it again at some point in the future. It’s shameless from the bookmakers, but what does it matter if it lets you get a free bet?